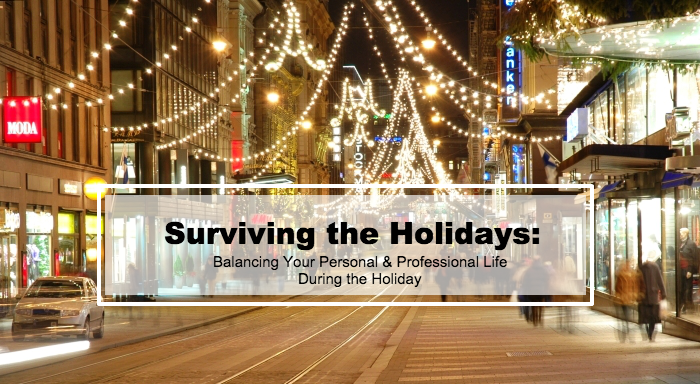 For most of us just because the holidays are rolling around does not mean our work stops. For some of us it even gets busier. The trick to not loosing your mind during this extremely all over the place time is to find a perfect balance between your personal life and professional life. Here are some tips to help you stay on track during what can be some of the most stressful times for all of us. Just like anything you do in life, the most successful ventures are those that are planned out. Make a to-do list of everything you have to get done per week. Don’t overwhelm yourself by trying to plan two-weeks in advance or even a month in advance during this time of the year. Once you have your week planned out, start converting that list in what can be accomplished daily. You’ve made your lists, great! Now lets add some structure. There is no way you can accomplish everything in one day, or sometimes in the week that you have planned out and that is where prioritizing comes in at. Start prioritizing what you have to get done immediately and what maybe can wait another day. Whether it’s getting your Christmas shopping in, or finishing the annual report. You have to give yourself the opportunity to breathe a little and figure out whats important to you, your work, and your personal life. Again, the key is not to overwhelm yourself during this time anymore than what you already have going on. And sometimes you are just going to have to say no. No you cant attend every Christmas party or Thanksgiving dinner, no you cant take your family to see the big NYE drop and to the Stone mountain park to watch the fireworks in the same day. You have to know our limitations and know yourself during this time not to run yourself into the dirt. And saying no just might to have to apart of that this holiday season. Take time to remembered why you’re celebrating this season. This should be the time you enjoy with your family and loved ones. Never get too wrapped up in everything you have going on to not take the time and enjoy this time of the year.Be thankful that you have this time to spend with the people you car e the most about and find happiness in it. You will get through this time and the best way to get through it is to revel in Holiday cheer!